This entry was posted on Sunday, August 7th, 2011 at 16:45 and is filed under Barack Obama, Foreign Policy, Politics, War. 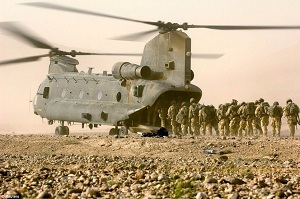 As a veteran who is conscious of the extreme anguish the families of our lost service-members are feeling, like so many others, I was horrified at the news of some of our nation’s finest warriors in a helicopter crash, apparently shot down by Taliban insurgents. While we rightly cherish the memory of their names, and all they have devoted in the name of our country, let us honor them also by remembering their surviving brethren when we set forth national policy. Currently, the commanders in Afghanistan and elsewhere are having to contend with a bitter, cruel and devious enemy which cannot be confronted with force of arms in any measure. The number of US casualties has been on a steady and disconcerting climb over the last several months, in what can be taken as a signal of the growing threat from this nearly invincible enemy. Our own rules of engagement may have come to be the cause of more battle casualties in Afghanistan than any other single factor. One may wonder, given our catch-and-release policy, if the insurgents responsible for this shoot-down may have been in our custody before. It’s a shameful reminder of why most liberals who have come of age since WWII should never be entrusted with the nation’s defenses, or at the top of the military chain of command. In this time of grief over our fallen heroes, let us dedicate a moment’s reflection to the purpose of reducing the number who will surely join them. It’s a lesson often neglected by politicians and their advisers, when setting policy for the conduct of military operations around the globe. Whatever we may think of the necessity of a given operation, when our warriors go into battle, we must not constrain and disarm them with rules of engagement that serve a political, rather than a military end. Veterans of almost every war in the last century will be able to cite for you examples of such policies, however, the service-members who went to Vietnam certainly became most thoroughly familiar with the consequences of rules designed not to destroy an enemy and thereby attain victory, but to serve a political aim, not so much at the tables of diplomacy, as for the consumption of misguided politics at home. This is the meat-grinder that has become the debate over the rules of engagement with which our troops must comply. In Afghanistan, under the direction of President Obama, and his appointed cabinet officers, the immorality of such a policy rapidly becomes apparent. More interested in serving the political concerns of their left-wing constituencies, policy is crafted so as to minimize political blow-back among his base at home, while the consequences on the battlefield are measured in blood, limbs and lives. General Petraeus was brought in to relieve General McCrystal, whose rules of engagement had begun to show weakness under a political dogma bent in an effort aimed primarily at not causing civilian casualties at any cost. As the new commander has been in-theater for roughly a year, we should begin to assess what differences he may have made. While I always hesitate to criticize the professional commanders in the field, I would be remiss if I didn’t examine the rules of engagement under which our forces now fight, and how politics at home are being permitted to constrain them to the detriment of our warriors. Imagine for a moment that you’re an infantryman. Further imagine being instructed that you cannot fire upon enemy combatants who are planting roadside bombs and IEDs in plain sight, because they do not present an imminent threat to your security. This is the sort of nonsense that is now being inflicted upon our troops in the face of an intractable enemy made more strong by these foolish rules. Now imagine capturing enemy combatants, knowing that the term of their incarceration will not be determined by the length of the conflict, but whether they had a gun in their hands at the time of their capture. Apparently, the wizards who determine these policies would likewise set the sentence for criminals on the basis of how far they had heaved their weaponry immediately before surrendering to police. This sort of nonsensical rule ensures that the insurgents are quickly returned to the fight, most within a year, to immediately re-engage against our soldiers. General Patton was noted to have remarked that he didn’t “like to pay twice for the same real estate,” but imagine his surprise had his chain of command told him that he could only hold prisoners a short while before allowing them to rejoin their comrades behind enemy lines. Our soldiers must now pay dearly, not merely for the same real estate, but the same prisoners, not twice but repeatedly. Naturally, US authorities disclaim responsibility, as most of the combatants they’re capturing are turned over to Afghan authorities in short order. There is also the self-defeating notion that we must not cause civilian casualties, at virtually any cost. The purported motive is based on the premise that to cause civilian casualties merely strengthens the resolve of the population against us. This hogwash is presented as part of our strategic aims, but in fact, it is another policy in service to the radical leftists who comprise our President’s political base. It is impossible to imagine having ever successfully overcome Hitler or Hirohito had we been forced to adopt these rules. Can you imagine flying bombers at altitude over the industrial cities of Germany and Japan, and instructing our aircrews that they must first do no harm to civilians? While nobody looks with glee at the prospects of civilians being killed, this astonishing requirement almost guarantees an increasing number of US casualties as the enemy on the battlefield adapts and responds by hiding more frequently in and amongst the civilian populace. This wrong-headed thinking virtually condemns more to die who might not otherwise, and it begs the question about our larger mission there. What are we now trying to achieve, with our forces inhibited from rising in their own fully vigorous and proactive defense? It’s an immoral waste of our troops in a meat-grinder, made worse by the fact that our current President has taken so long to set a course, and has yet to produce what could be considered strictly military objectives. Given these rules of engagement in service to domestic political concerns, it is right and proper to question the wisdom of a chain of command that is more interested in political perceptions by way of alleged humanitarian concerns for the enemy and their captive populace, than for the lives and limbs of our own noble warriors. It is for these reasons that I believe that future monuments to our war dead should not be constructed along or near the Mall in Washington, DC, but instead upon the White House lawn, so that future occupants will look out any window to tragic reminders of what the implementations of military actions in service to domestic political concerns have wrought. This wrong-headed thinking, and the disaster in human terms is one more reason why Barack Obama must go, next November. While these policies may have played no role in the loss of the helicopter and its precious human cargo including some of our finest warriors, it should serve to remind us that there are troops in the field, that the nation is at war, and when we send them to fight, they should arrive on the field not only with the best training and technology our money can buy, but also the benefit of a wise chain of command which knows why they’ve been sent, and for what they’re fighting, unimpeded by tawdry domestic political considerations. These sorts of policies aren’t a new enemy, but resurrected by President Obama from the historic ashes of the Johnson administration, they have new life, and new vigor, but they must be defeated. May we all hope and pray for those who have suffered in the tragic loss of these fine warriors, along with those who have preceded them, and may we find the strength of character to elect leaders who will understand the terrible costs of war turned to the purpose of domestic politics. The families demand it. The honored dead demand it, but most of all, our consciences should demand it. But if we continue to do what we are currently doing, they will like us and stop trying to kill us. They will see that we are really great people and they will stop fighting us. Sure they will. Using that same philosophy, liberals should love Republicans. They give liberals eveything they want, like the debt ceiling increase. But they still hate Republicans. Maybe, Republicans will wake up and nominate a Presidental candidate who will not give in to the liberals and will put the safety of our troops above the safety of our enemies. We can only hope. Good post Mark. The rules of engagement have never been for the protection of our troops and seamen. Look at the toll which was paid by the USS Cole and the USS Stark. The Stark was NOT allowed to have its defensive weapons active even when a threat was detected and the Cole was NOT allowed to use its security team the way it was supposed to be used. The scape-goats were the Commanding Officers who were obeying their rules of engagement. They were thrown out on their ears while the politicians said they had fixed the problem, ya, right… There was a time when this behavior would have been called 'giving aid and comfort' to our enemies, now it is called diplomacy. This is NOT a Republican or Democrat problem, this is strictly a political problem. Why is there not a mechanism to separate powers between the military and the politicians? There is supposed to be but keep in mind that ALL politicians lie… If a military leader said the things which our politicians say, they would be court-marshaled for dereliction of duty! I could be wrong about these things, I am only a disabled veteran who served for 10 years. This also annoys me, I served 10 years and have a permanent disability but I receive nothing from the government yet a Congressman can spend as little as two years in service, get rich and retire with a full pension and health care that a king would envy. At the same time the VA is charging former service members for their care (even service connected) or submitting claims to the service member's insurance company. Has this Country fallen so far that we cannot be honorable and take care of the people who protect us and take to task the individuals who are bleeding this country dry? I agree that this has long been a problem in both parties, but it has been decidedly more pronounced with Democrats at the helm. The mechanisms of separation already exist but the politicians seem bent on ignoring them.